A smart investment for your kid’s room is a two-compartment hamper. This will allow them to sort the light close from the dark close when they’re getting undressed. That will certainly cut down on your time in the laundry room. A mesh hammock or fishnet hung from the ceiling is a great place for stuffed animals, dolls and action figures. You can string a clothesline across the wall and use) to hang up artwork. A low bookshelf is perfect for their library. 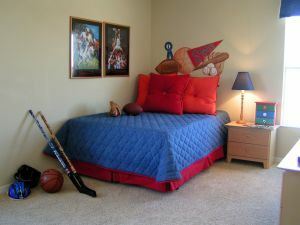 In fact, most of what you have in your kid’s room should be within their reach. You don’t want to put anything that requires them to do some climbing. This should be some plastic tubs outside for all the yard toys. There’s nothing wrong with your kids spending hours outside in the summer having fun. But they need to get into the habit that before they come back in the house everything goes into the bin. You should set up some type of “inbox.” This is where your mail goes. But don’t just leave it stacked up. Try to sort through it at least once a week. You can probably get rid of a lot of junk mail that way. Next to the inbox should be a bowl for keys. This will prevent the last minute scramble you have every morning as you search for your keys. This should also be spot designated for shoes. Instead of just having them flip off, maybe put up a rack or small bookcase where everyone gets a spot for their pairs. Your home can’t truly be called organized until you have done away with all the things you consider to be rubbish. This is where Junk King Fort Worth will be a big help. You can set up an appointment with these junk removal professionals any day during the week or on the weekend. All they ask is that you set aside a two-hour window. It certainly won’t take them two hours to clean up most of what you’re tossing out. The Junk King crew will do all the heavy lifting and loading. That means anything can go. Organizing your home is easy when you enlist the help of Junk King Fort Worth. This entry was posted in Fort Worth Junk Removal and tagged clutter, Junk King Fort Worth, organizing your home, rubbissh on June 30, 2017 by Junk King. Last updated July 1, 2017 .